“Clinker” – a colorful assortment of rock heated, baked, and melted by burning coal seams. Quarter for scale. You do not need a volcano for fire and molten rock—a coal seam will suffice. 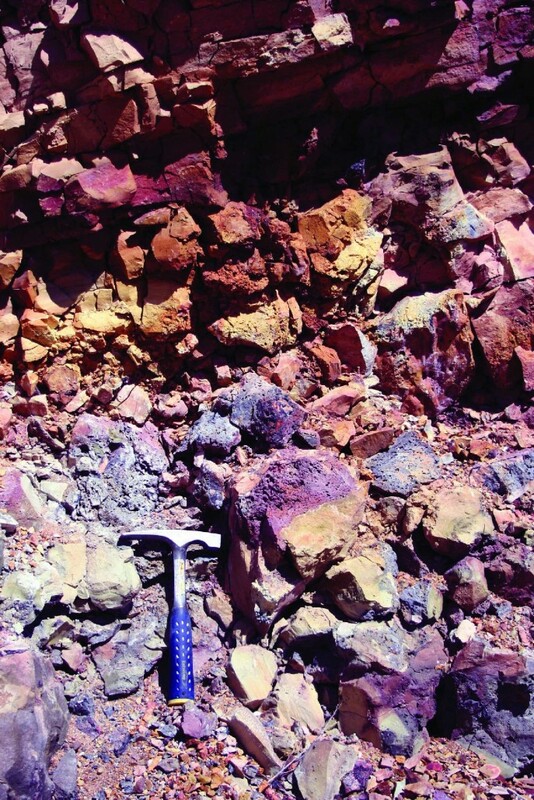 This GeoSights article highlights “clinker,” an odd assortment of rock heated, baked, and melted by burning coal seams. Coal seam fires burn throughout the world. The fires can be ignited by human activities or naturally by lightning strikes, wildfires, and spontaneous combustion. In the case of spontaneous combustion, heat is generated when coal chemically reacts with oxygen (oxidation) and moisture (the “heat of wetting”). These chemical reactions can take place at the surface with atmospheric oxygen and precipitation or in the shallow subsurface with seasonal fluctuations of the water table. Once ignited, the coal is reduced to ash, and its volume can decrease by more than 90 percent. Overlying rocks can then collapse into the resultant void space. Cracks formed by collapse can propagate to the surface, which allows more oxygen to reach additional coal below the surface and keeps the fires going. A troubling result of uncontrolled coal fires is the release of carbon dioxide (CO2), the greenhouse gas that has the biggest impact on global warming. Some researchers estimate that coal fires in China alone release as much CO2 as all cars and light trucks in the United States, or roughly 2 to 3 percent of the annual worldwide emissions of CO2 from fossil fuels. Clinker is derived from shale, siltstone, and sandstone beds surrounding the burned coal seams. The term “clinker” comes from the “clink” sound made when the baked rocks are walked on or struck by a rock hammer. Taken out of the context of its outcrop, clinker eludes identification. At this GeoSight location, some of the clinker looks like vesicular basalt in hues of red, orange, and brown, or even pistachio green. Some is nearly glassy like obsidian but with colors akin to Neapolitan ice cream. 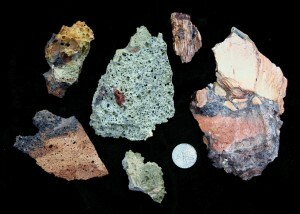 Much of the coloration comes from iron impurities. The red hues form under oxidizing conditions (iron oxides), while the greens form under reducing (oxygen-depleted) conditions. Fused breccias can form when overlying rock collapses into the void left by the burned coal seams. In Utah, the Burning Hills and Smoky Mountain of Kane County get their names from naturally burning, deep underground coal seams. But Carbon County is the place to see the clinker described above. The clinker of this outcrop is within a mudstone-dominated section of the Late Cretaceous (about 84 million years old) Blackhawk Formation, an important coal-producing geologic unit of central Utah. As a somber side note, on March 8, 1924, an explosion resulted in the deaths of 172 men in the nearby Number Two Mine of the Utah Fuel Company, located at Castle Gate. This was the third-deadliest coal mine disaster in the United States at the time, and remains the tenth deadliest. Some victims of the explosion are buried in the historic Castle Gate Cemetery directly across the highway from the outcrop. This clinker outcrop is located roughly 90 miles southeast of Salt Lake City and 10 miles northwest of Price, near the former town site of Castle Gate. The town of Castle Gate was dismantled in 1974 to make way for the current coal-loading facility that can be seen from U.S. Route 6. To get to the outcrop from Route 6, turn northeast onto U.S. Route 191 and travel approximately 1.3 miles to the small pullout on the left (just past the entrance to the Castle Gate Cemetery). The clinker outcrop is across the highway from this pullout. Please use caution near the highway, as the Castle Gate Cemetery is full.